The following list of useful books, publications and papers needs development; if you have additional good references please let us know via admin@isfglobal.org. Thank you. Global action plan for the prevention and control of noncommunicable diseases 2013-2020. World Health Organisation 2013. Global Atlas on Cardiovascular Disease Prevention and Control. Mendis S, Puska P, Norrving B editors. World Health Organisation, Geneva 2011. Global status report on noncommunicable diseases 2010. World Health Organisation 2010. Lowell S Levin, Alfred H Katz and Erik Holst. Self-Care. Lay Initiatives in Health. Croom Helm, London 1977. Noncommunicable Diseases Country Profiles 2011. World Health Organisation 2011. Preventing Chronic Diseases: a vital investment. World Health Organisation 2005. Public Attitudes to Self Care Baseline Survey. UK Department of Health, February 2005. Scaling up action against noncommunicable diseases: How much will it cost? World Health Organisation 2011. Self care support: A compendium of practical examples across the whole system of health and social care. UK Department of Health, January 2005. Chronic diseases: the neglected development goal. The Lancet, October 2005. Elwood P, Galante J, Pickering J. Healthy lifestyles reduce the incidence of chronic diseases and dementia: evidence from the Caerphilly Cohort Study. PLOS ONE 2013. DOI: 10.1371/journal.pone.0081877. Soller RW, Mann SG. 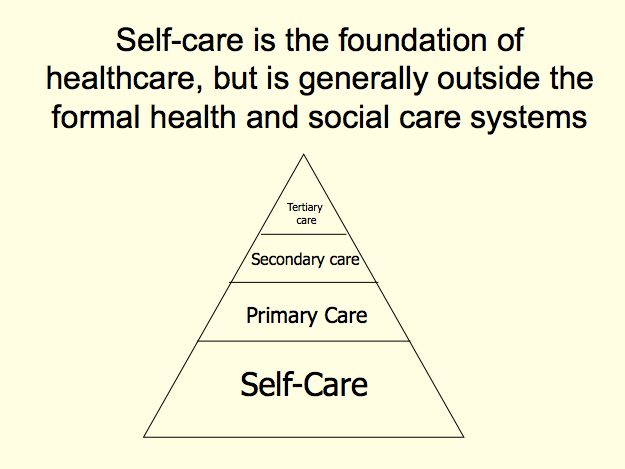 Gaps in Self-Care: Using a Systems Approach. SelfCare 2014; 5(1) 19-25. David Webber, Zhenyu Guo and Stephen Mann. Self-Care in Health: We can define it, but should we also measure it? SelfCare 2013 4(5):101-106. Weiss BD. Health literacy and patient safety: Help patients understand. Second edition. Chicago, IL. American medical association foundation and American medical association. 2007. Available from: http://psnet.ahrq.gov/resource.aspx?resourceID=5839.